The village of Riegelsville, a National Historic District, has a fine collection of commercial and residential buildings. Especially impressive are the mansions built by local industrialists. The bridge over the Delaware River here is one of the few remaining multi-span, highway suspension bridges with continuous cables. For comparison sake, consider that the San Francisco-Oakland Bay Bridge has two large back-to-back suspension bridges, but the cables aren’t continuous between the spans. 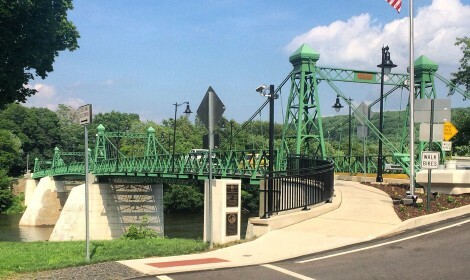 The existing bridge was built in 1904, as a replacement for the original bridge constructed in 1835. It pulls on anchors attached to each riverbank and was designed by John A. Roebling & Sons of Trenton, New Jersey. The Roeblings are also credited with designing the Brooklyn and Golden Gate bridges, and the aqueduct at Lackawaxen where the Delaware & Hudson Canal crossed the Delaware River between Pennsylvania and New York. For paddlers, Riegelsville has put-in for easy river access. (at River mile 174, above Cooks Creek).